Be "Interested", not "Interesting", and Embrace the Awkwardness! Contact improvisation is a dance form that explores the physics of two (or more) bodies in motion. With an emphasis on gravity, flow, and spontaneity, you get to stand, breathe, fly, jump, roll, and tumble with other bodies. 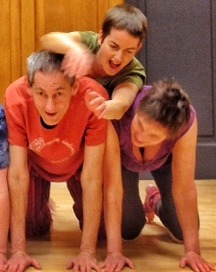 Get on the Ottawa Contact Improv mailing list c/o Ian! Allen – idallen@idallen.ca – to be informed of changes and cancellations. 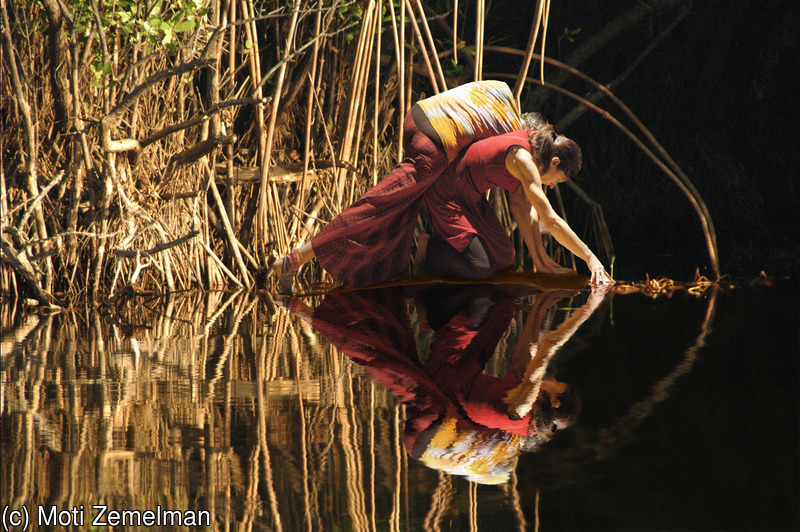 See the current Ottawa Dance, Movement, and CI Events Newsletter. Ottawa contact improv dance jams happen a few times each month with some exceptions; see the schedule below. Authentic Movement happens several times a month with some exceptions in the same studio just before the contact improv dance jam; follow the link for details. Weekly you can dance with Biodanza. See our Ottawa/Gatineau Contact Improvisation Dance Facebook Page. For many other Ottawa Creative Dance/Movement/Somatic events, see the Ottawa/Gatineau Creative Dance and Movement Facebook Group. It's all listed in the Ottawa Area Dance/Movement Newsletter. The Ontario Regional Contact Improv Jam will be in Toronto on Easter weekend. Follow the link for details. See Ian! about car pooling from Ottawa to Toronto. A contact improvisation dance jam is an open play session for all levels of movers, from the total beginners to the high flyers. Our Ottawa jams usually begin with an introduction to some of the basics of contact-improvisation, followed by an open dance jam. Classes adjust to the skill level of those present. All welcome! Come dressed to move. Contact Improv Dance jams are at Arts Court most, but not all, Saturdays. "Family Jam" dance dates. All Saturday events below end at 1:15pm (13h15). 11:15am Sat January   12 2019 First CI dance jam of the year! 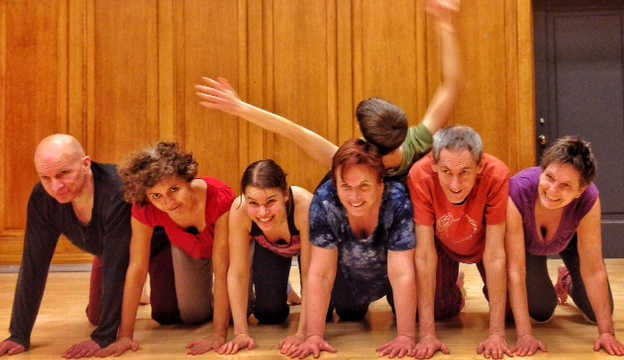 ** On March 30 we offer a one-hour introduction to Contact Improvisation dance class as part of the Ottawa Dance Directive fund-raising Dance Class Marathon FUNdraiser day. Cost $10 for the hour; proceeds go to ODD. Ottawa Contact Improvisation dance events take place almost every Saturday in air-conditioned comfort, usually Saturdays 11h15-13h15 at Arts Court second-floor ODD Studio "B" at 2 Daly Avenue, Ottawa. See the table above for the exact dates and times and facilitators. Arts Court Studio "B" is fully accessible by wheelchair, and there is an accessible washroom on the first floor of the building. Skill level: All skill levels welcome, especially new and old beginners! Location: Arts Court, Ottawa Dance Directive (ODD) Studio "B", Second Floor, - 2 Daly Avenue, Ottawa. Arts Court Studio "B" is fully accessible by wheelchair, and there is an accessible washroom on the first floor of the building. For many other Ottawa Creative Dance/Movement/Somatic events, see the Ottawa/Gatineau Creative Dance and Movement Facebook Group. And don't forget our own Ottawa/Gatineau Contact Improvisation Dance Facebook Page. and to various Dance New England events.